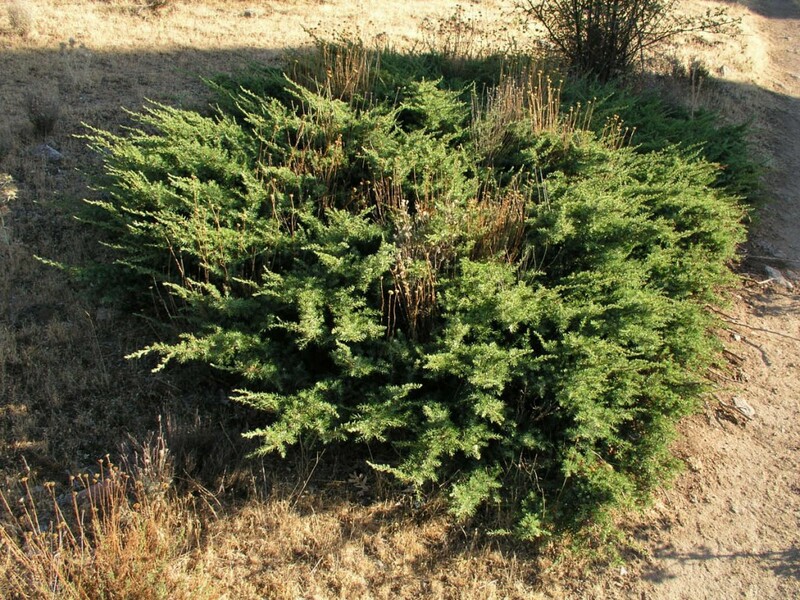 Juniperus communis is a low aromatic, evergreen conifer shrub to 2 m, forming flat-topped round patches several m wide. Twigs 3-sided. Leaves needle-like, sharp, to 1.8 cm long, midrib white above, in whorls of 3s, jointed at base. Flowers: None. Cones in axils, round, to 1.3 cm, berry-like, hard-fleshy, resinous, blue-black with white-bloom, 3-seeded. Foliage eaten by deer (Petrides 1972). Circumboreal including northeastern N. America. Habitat: Dry rocky open areas on sterile, dry, rocky soil, pH 5-8.5. Tolerant of drought. Moderately tolerant of salt. Intolerant of shade, flooding (Hightshoe 1988).